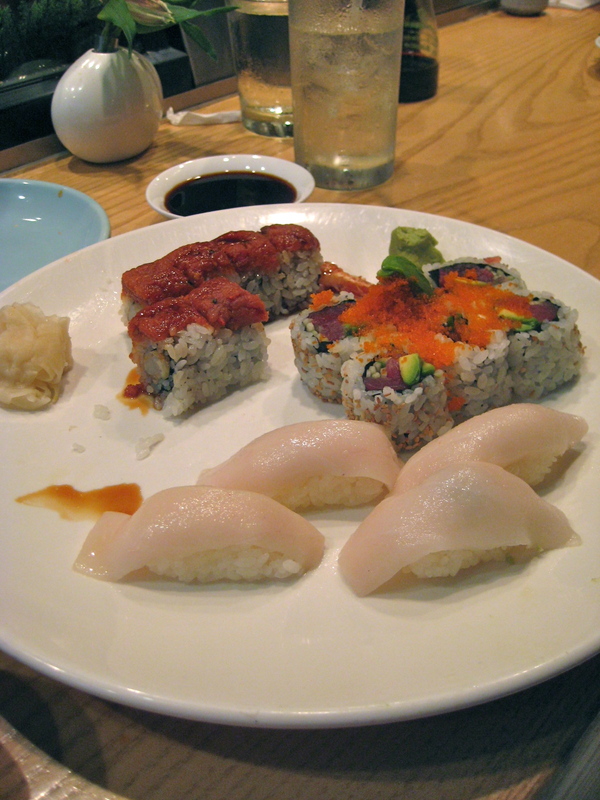 Kotobuki is a no-frills, straight-up sushi restaurant where it's all about the food. Located in a small, unassuming, simple space in a shopping center on Old Northern Boulevard in Roslyn, the place is usually bursting at the seams with hungry diners huddled in the waiting room and often spilling out onto the sidewalk. Even though this restaurant is located in the well-heeled North Shore town of Roslyn, the atmosphere is super casual so you will feel comfortable in flip-flops and a tank top on a hot summer day, and jeans and Ugg boots in the winter. The service staff is friendly and efficient, but the food can take a while to appear when they are busy. However, the food is so good that it's worth it. There are now four Kotobuki locations, three in Long Island and the most recent opening in Manhattan near Greenwich Village. Like so many restaurants with cult followings, Kotobuki does not take reservations. Thus, unless you get there at 5:00 (which we have done! ), there will be a wait, even if you're willing to sit at the sushi bar (which we prefer). 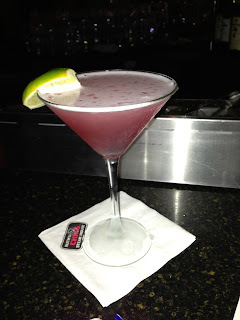 Luckily, they are nice enough to take your cell phone number so you can head a few doors down to Besito to have a drink while you wait (another favorite - review coming soon) and they will call you when your table is ready. Nonetheless, we've rarely waited more than 30 minutes to be seated. And trust me, it's worth it! Sesame Tuna Dip: Chopped diced tuna mixed with scallions, sesame seeds, sesame and chili oil, served with fried wonton chips for dipping. This item is not actually on the menu but usually is available as a special. Even though it was not listed on their special menu last night, we asked and they made it for us so it's worth asking about. The tuna is delicious, nutty and very spicy. It is addictive and there is never enough dip! 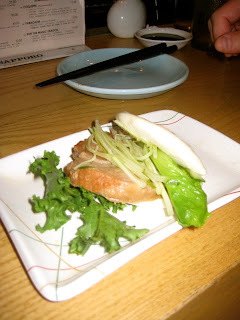 The Pork Bun: Another special that is not on the actual menu. A traditional Japanese-style pork bun. It's almost like a Japanese taco - a spongy, pillowy bun folded in half and stuffed with a large slice of roasted pork belly, lettuce, cucumber and mayo. When you bite into it, the richness of the pork is perfectly balanced by the crisp veggies. This may sound weird, but the combination of flavors reminds me of a gourmet Big Mac, one made with super fresh, high-quality ingredients that tastes as good as it looks on TV. This dish takes a while to prepare, but it's worth the wait. Sashimi Salad: Chopped romaine and seaweed salad topped with crisp steamed asparagus, salmon, tuna, yellowtail, shrimp, marinated octopus, shredded daikon radish, red onion and pickled veggies. Served with a side of spicy ginger dressing. I usually nix the seaweed salad and add avocado. This is a recent discovery of mine. Kotobuki's fish is so fresh and the quality is so great that as we came here more often, I slowly migrated from a rolls-only girl to an all-out sushi and sashimi devotee. I especially love their salmon and super white tuna sushi, which literally taste like butter even though they are raw. So, the sashimi salad is perfect if you love fresh fish and want to keep it light. The ginger dressing is like none I've ever had - it has chili oil in it so it's really spicy and flavorful. You only need a tiny bit and the salad pops with flavor. Another surprising thing about this dish is the fish portion is huge - at least four ounces, possibly more, of fish and the salad only costs $11.50. A huge value. Red Dragon Roll: Shrimp tempura roll topped with diced spicy tuna. This doesn't sound like the most interesting roll, but the spicy tuna on this roll is different from Kotobuki's standard spicy tuna. There is no mayo and the spice is really intense - it is not the typical Sriracha spicy tuna flavor but tastes like it is made with Togorashi, a Japanese chili powder. It is absolutely delicious, because the crunchiness of the shrimp tempura is given a kick with the spicy tuna, and then the sweet ponzu-like sauce that is drizzled over the top cools it down. Out of Control Roll: Tuna and avocado roll topped with tobiko (caviar). Another very simple roll that highlights the quality of the ingredients. The light pop of the caviar gives a nice texture to the soft avocado and tuna. My husband usually adds a dab of Sriracha (chili sauce) to the top of each piece. Yellowtail jalapeno appetizer: Yellowtail sashimi topped with sliced jalapeno, paired with thinly-sliced red onions and topped with yuzu sauce. Any of the rolls from the "Crafty & Ingenious" or "Special List" on the menu - they have come up with some amazing combinations! romaine hearts and spicy mayo on a rice cracker "bun"